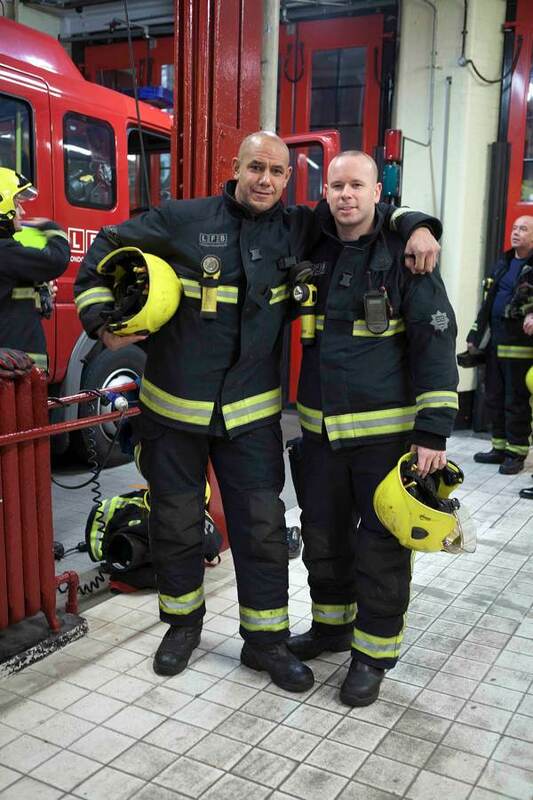 Photographer Colin O’Brien & I made a return visit yesterday to visit our friends, the firefighters of Clerkenwell, on their last working day before the closure of Britain’s oldest fire station after one hundred and forty-two years. They invited Colin to come and take their photographs as a dignified record of this long-awaited day that everyone hoped would never come. In fact Colin had joined White Watch, one of four watches at the station, for their last night shift earlier this week photographing their final roll call and the communal nocturnal meal they all share, which on this occasion was termed “The Last Supper.” When we arrived yesterday, we found the station busy with activity as the firefighters made their preparations for departure, clearing out personal lockers and removing moveable fixtures, such as the hefty snooker table that a team of men were manhandling from the basement. 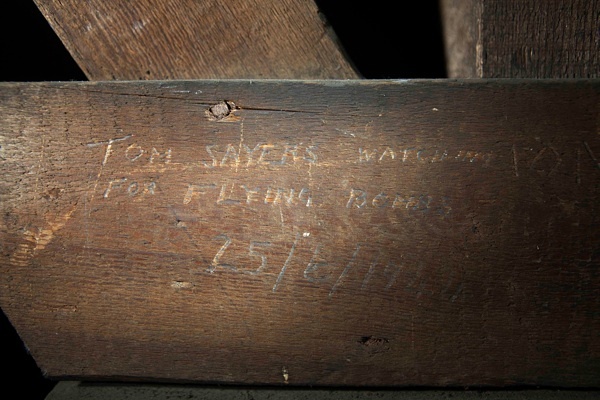 We took this opportunity as our last chance to seek the wartime graffiti up in the roof that we heard had been left by a firewatcher seventy years ago. Climbing up through the senior officers’ quarters, unoccupied for decades, we emerged onto a high balcony at the rear of the station with views across to the City beyond and the natural advantage of this location was immediately apparent, upon the peak of the rise at Mount Pleasant. From here, another ladder led us into the loft and the clamour of the city receded to a distant drone as we searched the roof space for graffiti. 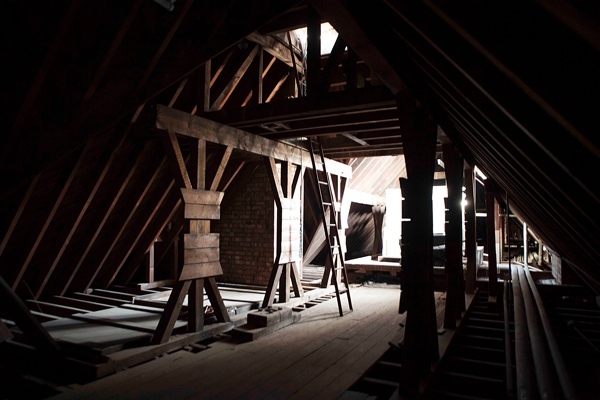 Little has changed up there, and finding ‘TOM SAYERS WATCHING FOR FLYING BOMBS 25/6/1944′ written in pencil upon a beam brought the past closer to us, as if we might have climbed the ladder, opened the roof hatch and entered that June night of 1944. 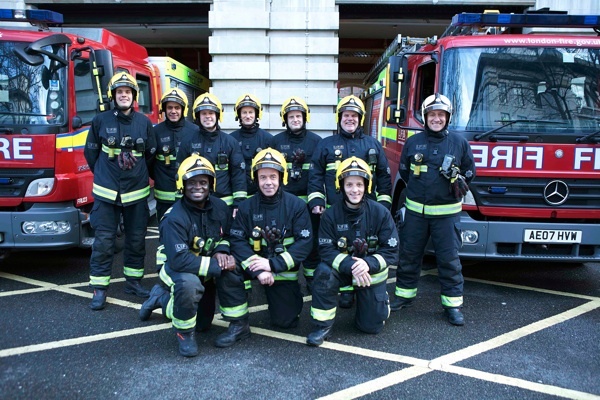 Yet time was running out at the fire station and we descended back to ground level, where the business of the hour awaited us – the taking of the final group portrait of the firefighters. In spite of the melancholy timbre of the day, we found them ebullient and even playful so it was only when I found myself standing in Rosebery Ave, with the firefighters lined up in front of two fire engines outside the station as Colin took the photo, that I realised the enormity of the event. Traffic slowed down, drivers honked their horns in tribute and passers-by stopped in their tracks. Commonly when I am on assignment with a photographer, no-one pays any attention but from the reactions of those in Rosebery Ave, I realised that everyone knew what was going on and stood in wonder at the sight or they drew out their phones to record it for themselves – because it was a moment in the history of London we were all witnessing, as the closing of the oldest fire station was recorded at the time of the closure of ten fire stations across the capital. Once the photos were done, I joined Captain Tim Dixey in his office for a few last words and his statements were characteristic of the stoicism we encountered in the face of the circumstances of that day. “It’s a sad day when the beautiful old station closes, but it’s all over now, the decision has been made and we’ve got to move on,” he admitted with admirable restraint, explaining that his watch start work next day at Islington Station which will be their new home. “Come and join us for a cup of tea, if you are passing,” he suggested, extending a friendly hand. 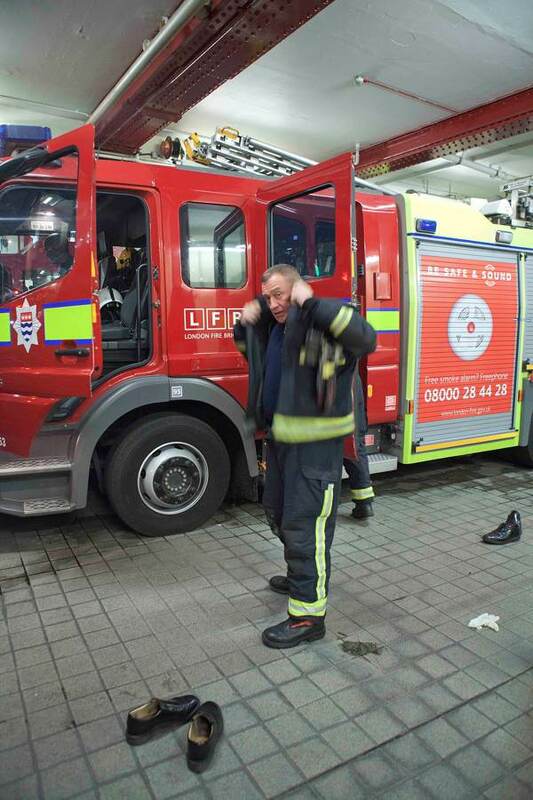 Today at 9:30am the final watch ends at Clerkenwell Fire Station. I hope there were no redundancies and all got to keep jobs. GA – wonderful and dignified article! Is there something wrong with the building? Why do they have to close? Please don’t tell me its a political thing – good heavens 142 years services obviously accounts for nothing these days. Best of luck to you all. Ruth Offer (NSW Rural Fire Service volunteer). Gentle author, you have done all you could do by rendering this Fire Station, and this poignant day, immortal through your images. This remarkable presentation of photographs and editorial as a tribute to the Fire Service leaves me deeply saddened and angry that what must be a very special fire station, the oldest operational one left, could not be retained, capturing and continually showing an example of the spirit and courage of the fire service since it was first conceived. Of course, this same spirit exists in all the stations, but surely there must be a place for the oldest and therefore most historical, to be retained all the time there is a need, which certainly there must be in central London, so why was this one picked to close, the begging question we are left with? A truly sad day – but what dignified, brave women and women have served here down the years. Thank you for this record of the final working hours of this station. Just want to extend my heartfelt thanks to all the brave firemen and women who do such a fantastic job. Wouldn’t it be fitting if this building were to be turned into a museum for the fire service? But, I suspect it will end up as more luxury flats. And so a mayor who campaigned for office on a ticket of understanding the emotional value to Londoners of the iconic Routemaster has now proved to be just another of those who knows the price of everything and the value of nothing. Shame. A fitting tribute, thoughtfully and skillfully written, but how sad it all is. What happens now to this beautiful building with so many associations from the past? Why did it have to close? 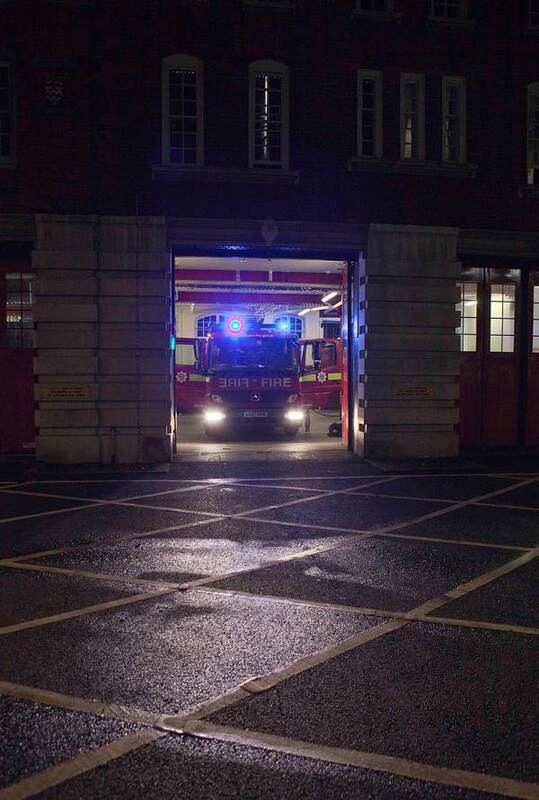 Closing fire stations is another example of the way in which the current Mayor is destroying the historic fabric of London, social as well as physical. They have done a great lifetime job in great historic architecture. My deepest respect and all the best for them! So very sad. 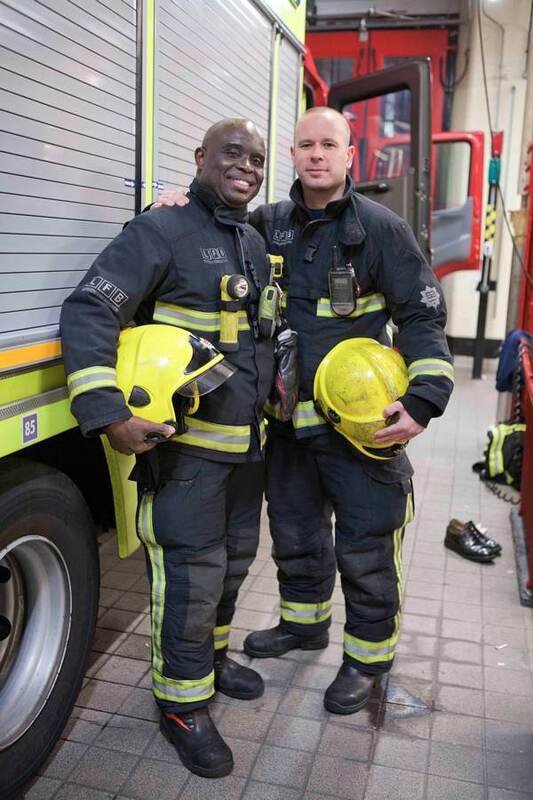 Thank you Clerkenwell fire-fighters and to fire-fighters everywhere for keeping us safe. Boris Johnson, you should hang your head in shame! 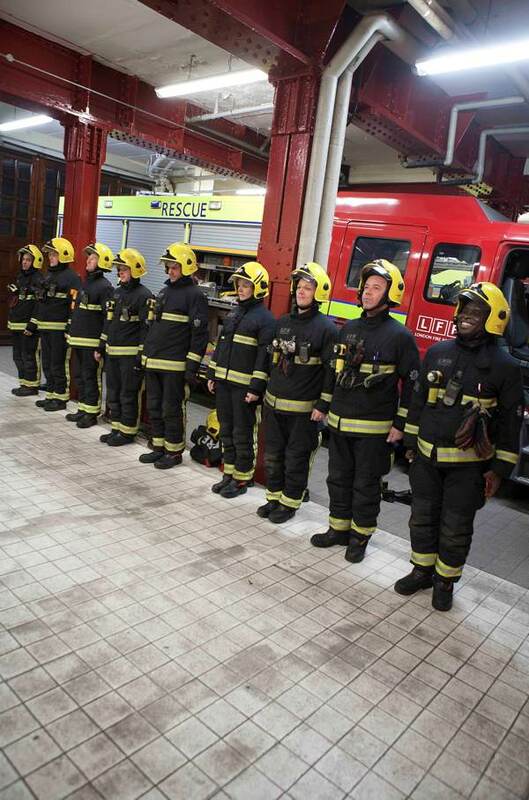 Just returned from Clerkenwell Fire Station farewell gathering – massively emotive to see these heroic people forced to leave their jobs & sacrifice their work to the altar of King Boris. To add salt to the wound, they were instructed by the Fire Brigade Service bosses not to leave proudly wearing their uniforms showing service to the populace, but instead to exit incognito in everyday clothes. Had they decided to wear their uniform they were threatened with being disciplined. Just like when we had a local march in support of the station & workers – the staff were moved to another station in case they were tempted to leave their posts & join the march! These are incredibly principled people & to be treated with such disdain & distrust shows what a nasty, low & obsequious bunch the Fire Authority bosses are. The closure of these 10 fire stations has absolutely nothing to do with cost – saving each household just ONE PENNY a day. It is indicative of the government & Boris’s hatred of the common man & total disregard of the fate of Museums/Art Galleries/Architecture/Schools/Hospitals/Care Institutions & the common public! Let alone the Kings Cross fire/Bishopsgate bombing/Tavistock Sq. & Kings Cross bombs. Is the next step each individual house must pay to a fire insurance company for their private fire fighting machines to come out, just like post 1666 Great Fire of London? Sink your head in shame Boris Johnson. A tragic end to a historic fire station. Thanks for this wonderful tribute in photographs and words. At some point in the not too distant future this will become a trendy London party warehouse hosting exclusive events and high end balls. I wonder if those who partake in these future festivities will remember that this was once a place that served London with utter and complete dedication every day for over 140 years. Thank you for your touching tribute to these fine people — and the venerable station. So sad that such a decision was ever taken to close something so historic — and so critical. Such a waste. But your stories this week have paid them proper homage. 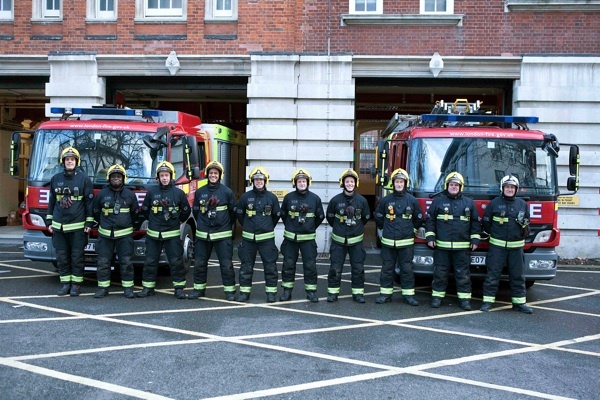 I served for five years at Clerkenwell Fire Station at the end of the 80′s & although long gone now (serving at another station now), it made me very emotional to see Green Watch leaving for the last time! When I first arrived at Clerkenwell , I was immediately taken aback by the history associated with the station & feel so proud to have served there. During the period when the mobolising system was being updated I found in my possesion the original call bells, which has summoned many a Firefighter to a cry for help (shout) over all those years….some responding & never to come back sadly. Good ship….God Bless to all those who served in her!! When the first person dies due to the delay in getting to the fire from a longer distance away I wonder if mad Boris will pause from supping his Champagne – I doubt it ! 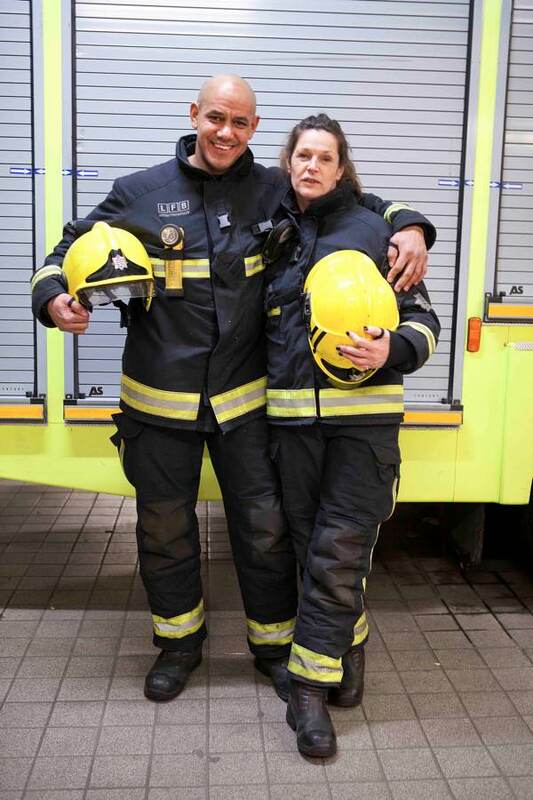 Thank you so much for this and your other articles on Clerkenwell Fire Station. I feel a strong attachment to the place and fondness for the firefighters there, as I have lived across the road for four years. I was never brave enough to go and say hello to them, but it always pleased me when I looked out the window to see them doing their drills or coming back from a call-out. I will miss them greatly and am deeply enraged that they have been closed down in this manner. I wish the men and women of Clerkenwell Fire Station all the best and thank them for their presence in my neighbourhood these past years. May God bless them. The closure of ten London fire stations seems to me to lack forethought entirely. The closures only save £45 million over two years – a pathetic amount of money. But isn’t it obvious that in two years time, there will need to be even further savings. Why not close all the fire stations now and save the entire budget for good?? Who needs a fire service? Fear of fire is so yesterday – much too much nannying is going on. Everyone has smoke alarms, and people should be prepared to put out their own fires. Insurance will protect those that think ahead. Selling off the fire stations will raise millions, and lower taxes. Why on earth should we all pay for blokes with hoses?? Eh? Judging by the size of the building I get the impression that it housed more crew in the past than it did at the time of it’s closure. The comment that your access to the roof to see the wartime graffiti took you through disused rooms for senior officers suggests that this is the case. How many fires and other incidents did the crews attend in recent years compared to the past? By and large the impression one gets is that the number of fires is not as high as it once was for which we should all be thankful. I do hope that the building will be sympathetically treated in the future. I understand fire deaths in London are on an upward trend. And beautiful buildings which burn become lost to us too. A lovely old building, destined to be flats no doubt? Just don’t turn it into a fish and chip shop like they did in Doncaster. 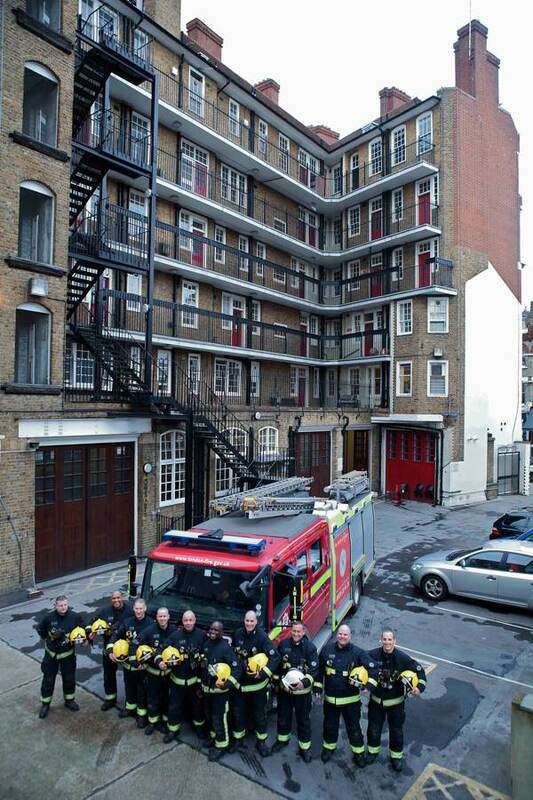 I served at Clerkenwell from 1974 to 1980 Red Watch. this was the highlight of my working career, PE,P, ET. a wonderful bunch of guys. So very sad to see the end of a wonderful Fire station, will be sadly missed by all. 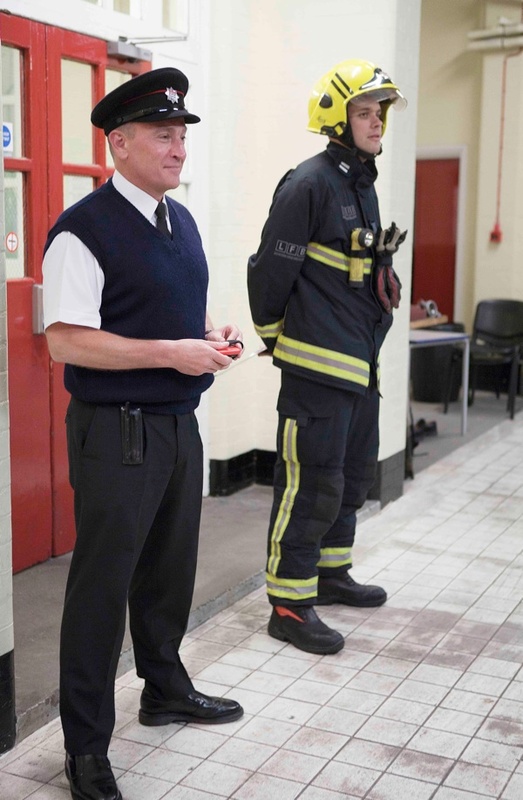 I came from Scotland at the age of eighteen and after training at Southwark was posted to Clerkenwell on the White Watch in 1964. What a great station and a great bunch of guys.